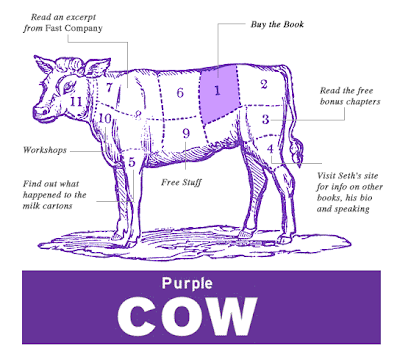 I've mentioned Seth Godin's book Purple Cow in my top 5 business books list before. Recently I've been talking to quite a few people about the concept and I thought it was worth briefly touching on here because I love the concept and it definitely played a part in inspiring us to start Shoes of Prey. The purple cow is a business analogy. Imagine you're driving past a field full of cows. All the cows are the normal black, brown and white colours. You'd barely notice them. Then imagine you see a purple cow in the field. You're immediately interested and you turn to the person next to you and say, 'Hey Jodie, see that purple cow over there? Wow'. You might even call you're mate Mike who's into cows, 'Mike, holy crap I just saw a purple cow. You come across one of those before?' While the book was written pre iPhone, Facebook and Twitter you'd probably take a photo on your iPhone, post it to Facebook and Tweet it. 'Crazy, just spotted a purple cow'. All those black, brown and white cows are like normal businesses. They do their job well, occasionally someone will notice them, but they don't do anything extraordinary. The purple cow is a business that does things differently. It's remarkable. You tell your friends and acquaintances about it. The purple cow as a business is much easier to market. It's remarkability lends itself to word of mouth marketing, PR, social media / viral marketing and search engine optimisation, all great marketing channels in today's online world. When Google launched they had a purple cow, their search engine worked so much better than any other search engine. It was remarkable. Zappo's started out selling normal shoes online, nothing purple cow about that. They developed a purple cow with their customer service. Free upgrades to 24 hour shipping, free return shipping, a 365 day returns policy and customer support staff who go above and beyond, all remarkable. I'm sure you can think of plenty of other businesses that are purple cows too, however most businesses aren't purple cows, they're not remarkable and it's that much harder for them to market themselves to new customers. Prior to launching Shoes of Prey Mike, Jodie and I had decided we wanted to do something in the online retail space, but we wanted a product that was a purple cow. It was that thought process that lead us to offering custom women's shoes online. What's purple cow like about your business? Lol, I'm sure you'll be able to give it a nice shade of purple Chris!